In a changing world, we're at center stage in the Disney Springs™ Resort Area. 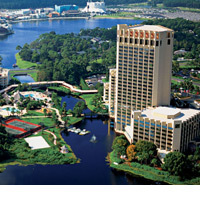 The 27-acre Hilton Orlando Buena Vista Palace - Disney Springs Area features 1,014 spacious newly renovated guest rooms and suites, seven restaurants and lounges, and a wealth of recreational offerings, making it one of Florida's most complete destination resorts. Child-care information is available through Guest Services at the Hilton Orlando Buena Vista Palace - Disney Springs Area. There is a Disney gift and sundries shop, an Alamo rent-a-car desk, the Watercress Cafe, Pastry Shop & Mini Market, the Outback Restaurant, the Kook Sports Bar, Lobby Lounge, men & women's boutique, business center, laundry, currency exchange, and both valet and self parking. 1,014 rooms and suites, most of which feature a private balcony or patio, in-room refrigerator, king or two queen-size beds, cordless telephones with voicemail, high-speed internet, OnCommand movies, Playstation and WebTV.